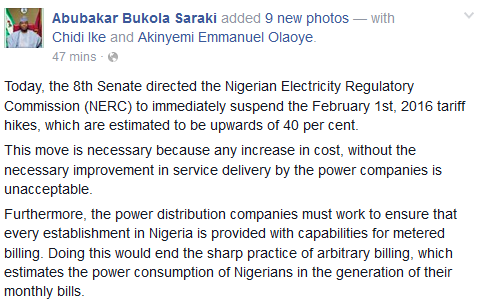 Welcome to Mercy Ebute's Blog: Stop tariff hike, Senate orders NERC. Stop tariff hike, Senate orders NERC. Senate President Bukola Saraki in a Facebook post says this was part of the senate's resolution during their plenary today February 16th. That is a step taken in the right direction by the Senate.